Over the years the Center has had the singular honor of hosting high profile visitors representing the Government of Bangladesh as well as representatives of the United States government in Bangladesh. Some of them are detailed below. The Subir & Malini Chowdhury Center for Bangladesh Studies at UC Berkeley was delighted to welcome Bangladeshi politician and former Foreign Minister of Bangladesh, Dr. Dipu Moni to campus in the summer of 2018. Dr. Moni is a Bangladeshi politician who served as Foreign Minister of Bangladesh from 2009 to 2013. Currently she is a Member of the 10th National Parliament of Bangladesh; Chairperson of the Parliamentary Standing Committee on the Ministry of Foreign Affairs and the All Party Parliamentary Group on Human Rights; Member of the Parliamentary Standing Committee on the Ministry of Defence; one of the four Joint General Secretaries; and one of the four official spokespersons of the Bangladesh Awami League. Dr. Moni is also the Chairperson of the Board of Trustees of the Asian University for Women and a Senate Member of Dhaka University. The Center had the distinct pleasure of hosting Ambassador Priyatosh Saha, Consul General of Bangladesh in Los Angeles, Dr. Tawfiq-e-Elahi Chowdhury, Adviser (Minister) to the Prime Minister on Power, Energy & Mineral Resources, and Dr. Zahangir Kabir, Regional Agronomist, Natural Resources Conservation Service, Vacaville Service Center, United States Department of Agriculture on May 10, 2017. During the occasion, the Ambassador presented a beautiful oil painting to the Center. Please see below for a picture of the painting as well as of the event. 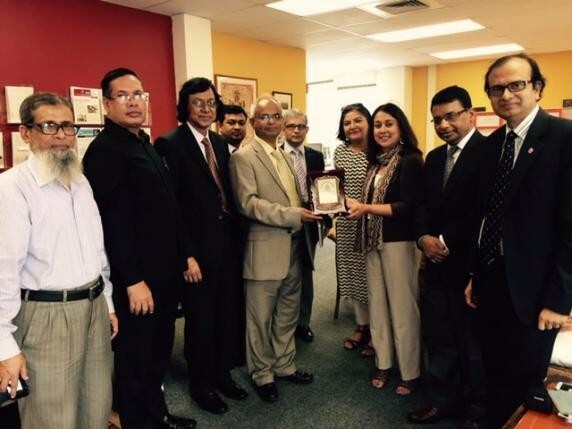 July 20, 2015: The Chowdhury Center hosted a 12-member delegation of top ranking officials from the Higher Education Quality Enhancement Project (HEQEP), Ministry of Education, Bangladesh, who were visiting institutions of higher learning in the US on a fact-finding mission to gain knowledge of best practices in order to improve the quality of higher education in Bangladesh. The HEQEP is a unique project under the Ministry of Education aimed at improving the quality of teaching-learning and research in Bangladeshi institutions of higher education through encouraging innovation within universities and enhancing technical and institutional capacity of the higher education sector. This project is supervised by the University Grants Commission (UGC) of Bangladesh and is funded by the government of Bangladesh as well as the World Bank. Among the attendees were the Secretary of the Ministry of Education, the Vice Chancellor of University of Rajshahi, and the Additional Secretary of the Ministry of Education. A detailed list of all twelve members is HERE. May 6, 2015: The Center hosted a reception in honor of US Ambassador to Bangladesh, Ambassador Bernicat. Photographs of the event are included below. Please click on the blue tag on the top right had corner to scroll through the album.